2. Add onion, green chilies, garlic, jalapeño, cumin, celery and red pepper. Sauté until onion is tender, about 5 minutes. 3. 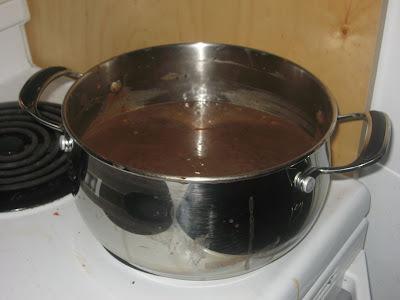 Add beans with juices and broth. Bring soup to boil. Reduce heat to medium-low; cover and simmer until flavors blend, about 15 minutes. 4. While the soup is simmering brown the ground beef and break it up. When it is browned mix it with the Taco Seasoning. Add the beef to the soup once it is pureed. 5. Puree 3 cups soup in batches in blender. Return puree to same pot. 6. Mix in 6 tablespoons cilantro. Season soup to taste with salt and pepper. Add the frozen corn and cooke for a few minutes longer. 7. Ladle soup into bowls. Top with dollop of sour cream and tortilla chips. Sprinkle with remaining 2 tablespoons cilantro. 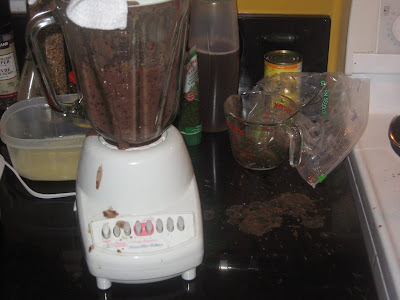 Ok when pureeing in a blender I have an important..... lesson for you - don't use the high speed. Rather use a slow speed and pulse until it is well pureed. ALSO I would take the little piece out of the top of the blender. if not you are likely to suffer the same fate as me .... being covered in yummy soup and having your kitchen covered in yummy soup. Here is the soup all mixed and pureed. We also added some frozen veggies at the end to kick up the veggie and health factor! 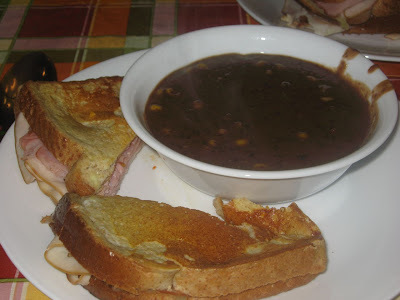 We also had Monte Cristo Sandwhich (taken from RR on Food Network however I use a different black bean soup recipe. 1. Spread bread with a light layer of pepper jelly then build sandwiches using 2 slices each of ham, cheese and turkey per sandwich. 2. Beat eggs with milk and 2 teaspoons hot sauce and season the eggs with a little salt. 3. Heat a griddle pan or nonstick skillet over medium heat. Melt butter in skillet. 4. 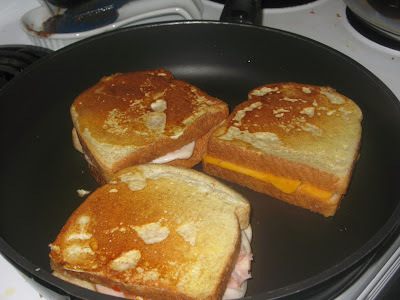 Dip each sandwich in egg coating and cook 3 to 4 minutes on each side to melt cheese and warm the meats through. This is the spread I use and I LOVE it. I also is really good on wraps with ham and cream cheese! 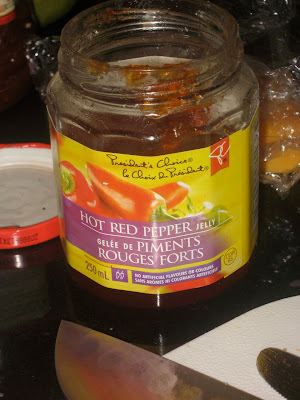 However some people in our house do not like this and prefer a sweet chili sauce. Love Black beans.. soup is great too!! freezes well, it's good on protein and low fat. Looks good!